LC Technologies was featured recently in a BBC News article covering assistive technologies, which enable people with disabilities to live fuller, more productive lives. According to the article, one in five people in Europe and America have a disability – that’s a billion people worldwide (from the World Health Organization). Since many are unable to work, the poverty rate of people with disabilities is about twice as high as the rest of the population. BBC introduced readers to five technologies that utilize prosthetic limbs, smart glasses, and eye movement – to name a few – that help people with a disability to enjoy and excel at life more than they ever could have imagined, post-diagnosis. Neurons controlling eye movement are more resistant to degenerative diseases, such as multiple sclerosis and motor neuron disease. That means people diagnosed with the diseases can leverage the power or eye movement to communicate and to participate in daily life. 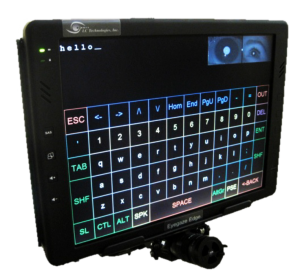 Over the years, our Eyegaze Edge has continued to evolve into the cutting-edge technology that it is today. When it was first invented, the Eyegaze Edge achieved its goal of enabling eye movement-controlled technology functions, the device was large and out of reach financially for many users. This kind of mobility means users can perform even more tasks using their eyes. In fact, about 12 books have been written on our Eyegaze Edge.